These were all taken a few weeks ago on a day trip to Luxor. Touring the ancient ruins and the surrounding countryside reminded me that there are a million shades of sand. Look for Luxor in a Day blog post in the next couple of days! My name is Dahab Hassan. 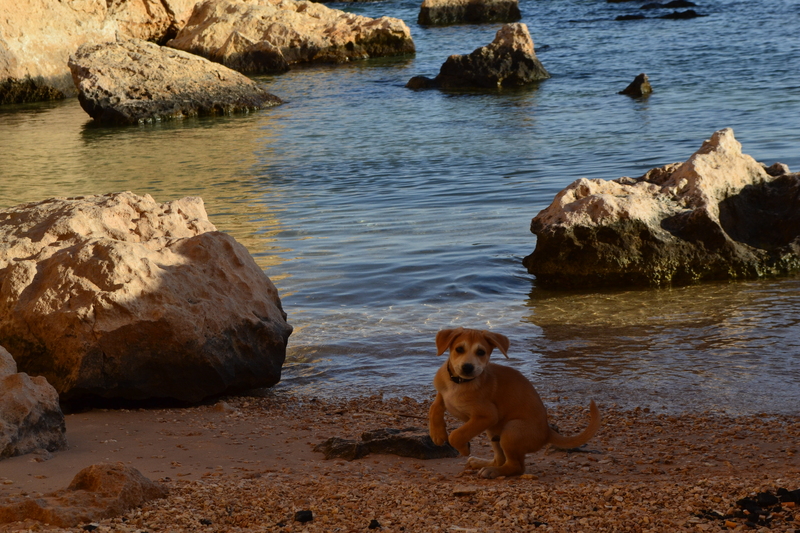 My title is Head of Security and Customer Relations at OTA Diving & Travel. Today we are taking one of our guests to Ras Mohamed National Park. What’s unusual about this trip is that usually we go by boat, but today we are going by car. A new adventure awaits! 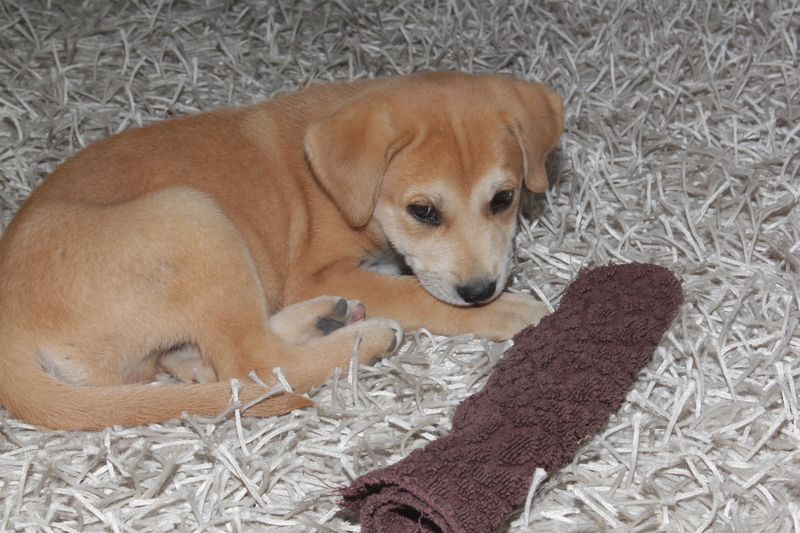 So we get into the car and I find a spot on the towel and I go to sleep….the car ride is smooth and comforting and all my people are around me. Ras Mohamed is only about 15 kilometers from Sharm el Sheikh and when we get to the gate we get our tickets and pass right through. We drive on a bit and come to the Arches which mark the Gateway to the Ras Mo beaches. We pass a rock on the way and stop for directions. We stopped here to find our way to the beach! 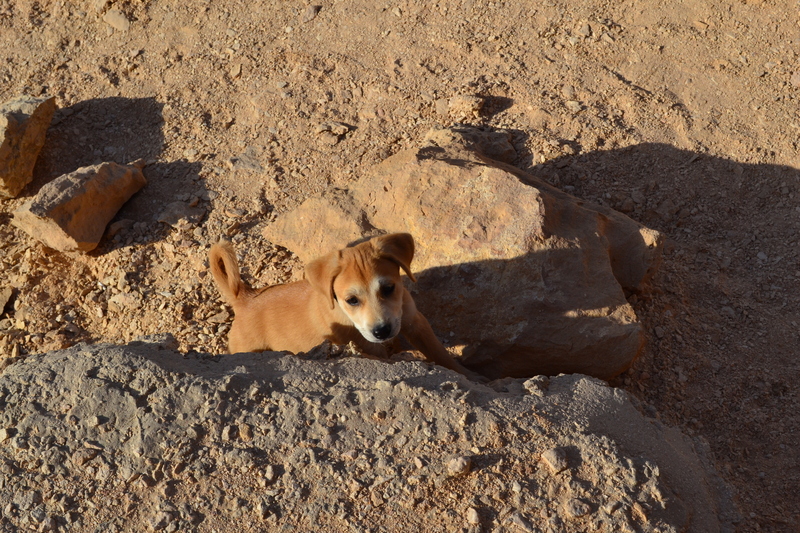 The car stops and I jump out and immediately survey the area. No bad guys here, now off to find a suitable place to set up camp. I find a nice shady spot and I call over to the humans and tell them to set up camp here. My humans lay out a blanket and bring out all their dive and snorkel gear while I continue to explore the area. Look! I found a seahorse! and set me in the water…..whoa! This feels strange and I paddle like crazy to get back to shore! There is lots of laughter from the humans. I find a seahorse on the shore and help get him back into the water. Then this nice lady comes by and congratulates me! The humans take a lot of photos and start to pose like this……then the girls take off on the trail and I stay behind with my daddy. But I want to follow the girls…so I start off on the trail. Daddy is following me! We start to climb the rock up to Shark Observatory, but there is a lot of stopping and posing for photos on the way! Soon Daddy is following me, seems like four legs are better than two! Here is my mom on the left and our guest, Susan on the right. Posing! not only because they keep stopping to take photos of themselves or me in the spectacular scenery here. Up near the top of Shark Observatory there are some high stairs that my little legs cannot climb. I get carried up the last stairs to the top and then I’m set free to run! I run to join my family at the summit of the Observatory! This has been a great day out and I can’t wait to come back to Ras Mohammed National Park! 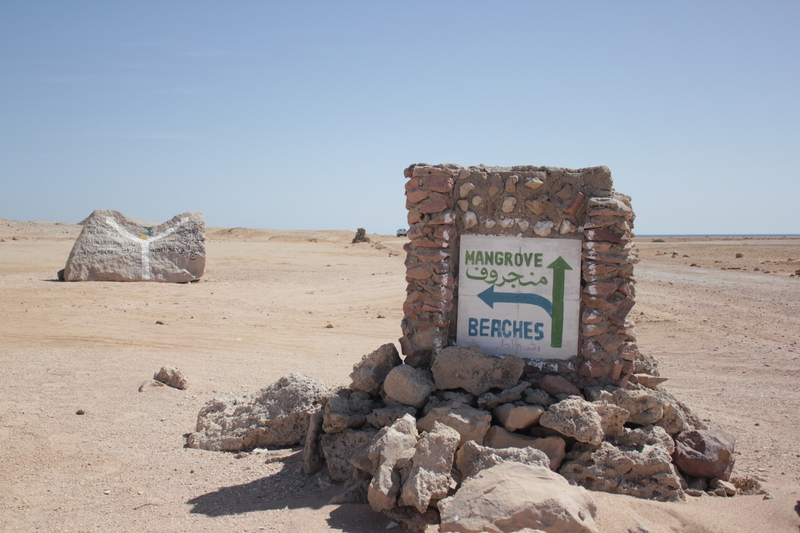 Ras Mohammed is Egypt’s first National Park, founded in 1983 and expanded in 1988 to include two islands, Tiran and Sanafir which are located approximately 6 km offshore from the Sinai Peninsula. The total park area covers 480 km², including 115 km² of surface land area and 345 km² area over water. 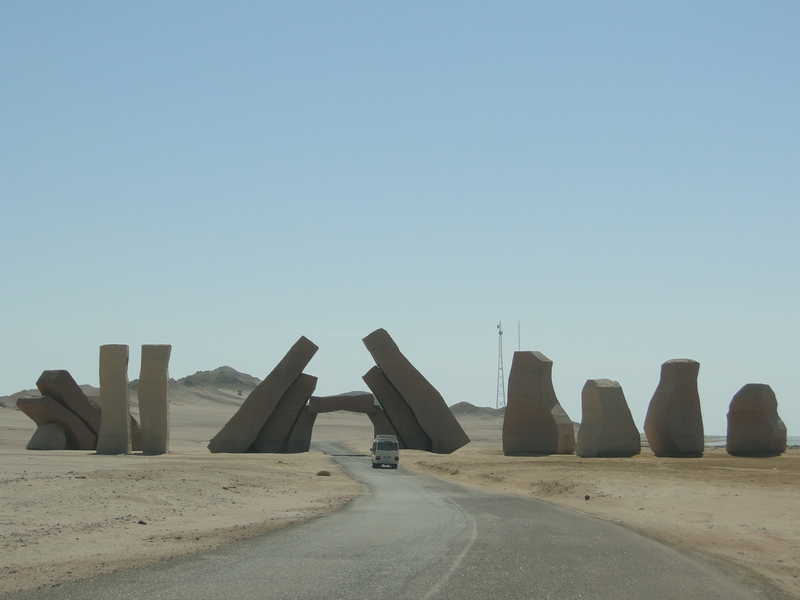 Ras Mohammed Park sits at an advantageous site at the extreme tip of the Sinai Peninsula. This position at the convergence point of the Gulf of Suez and the Gulf of Aquaba is awash in strong currents that bring rich nutrients to the area. Shark & Yolanda Reef is the most famous dive site in Sharm and one of the most spectacular dives in the Red Sea. It is well known for it’s abundance of stunning coral and huge schools of jackfish, barracuda, and batfish that thrive on the nutrients brought in on strong currents. This map displays a classic dive pattern: dropping in at Anemone City, following the current over the drop off to Shark Reef. 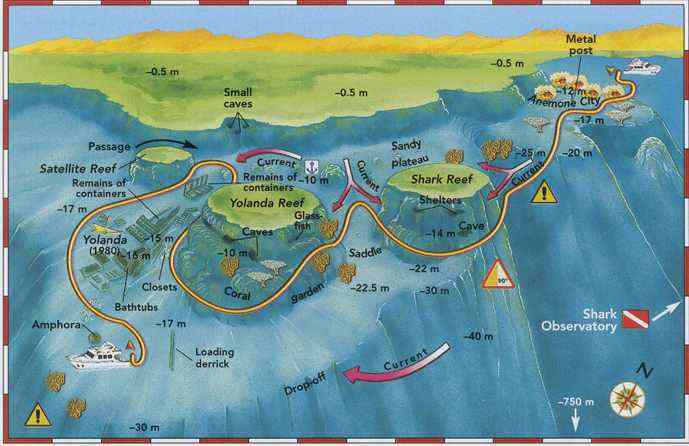 The wall at Shark Reef plunges to more than 700 meters. Swimming along the sheer wall of Shark Reef you may encounter huge schools of jacks, barracuda, and batfish. Swimming with the reef to your right you’ll approach the saddle which connects Shark to Yolanda Reef. Great day out in The Straits of Tiran this week with a combo of divers and snorkelers on the boat, it was comfortable with plenty of room on the dive deck and there were plenty of people to talk to and share some experiences with. Our guides were Kareem and Ayman leading the divers, Seif was leading the snorkelers, Osman was taking photos and working his magic underwater, while Speed was there to help out and make sure that everything ran smoothly. We were cruising on Maka with one of my favorite crews led by Captain Ibrahim. There was a bit of wind as we left Shark’s Bay Marina but the sun promised to warm things up. Learning Arabic can be daunting! I toyed with the idea of taking formal lessons where I’d learn to read and write Arabic letters but after one go with the Rosetta Stone language program I gave it up! Egyptian Arabic has it’s own vernacular that is reported to be the most widely understood form of Arabic. It’s a bit different than the Rosetta Language program so I decided to concentrate on learning the language verbally and in it’s text and social media friendly Latin letter form: Franco Arabic. Franco Arabic is very helpful for taking notes and keeping a dictionary without having to learn a completely foreign alphabet. Franco Arabic is also a great way to remember pronunciation as there are letters in Arabic that do not equate to anything in the Latin alphabet. Eventually when my vocabulary is a bit better, I would like to learn to read and write Arabic, Inshallah. And ahumdallah, I get a mini-lesson in Arabic. I start scribbling in my notebook, adding my new words, correcting old ones, and crossing out some earlier misguided entries. It’s been frustrating! Sitting in a room with people having lively conversation (no matter how mundane the topic, all Egyptian conversation is lively!) and not knowing what is being said and not able to contribute can be frustrating. That’s how I got started with the interrupting habit. People light up when they see you are trying to learn their language! I usually get an overwhelming response from everyone in the room and sometimes my queries lead to interesting conversation. Usually between the Arabic speakers so I don’t know exactly what’s being said, but it looks lively! There’s a lot more to be said about this topic so I’ve started a category Learning Arabic that I’ll post in regularly. I’d love to hear from others who are learning the language and any techniques, tips, words are always welcome! This is a question I’ve been asked a lot lately. Hardly surprising considering the constant stream of scary images you see on TV and the internet. You’d think the country was in complete and lawless chaos, which I am happy to inform you, it is not. Sharm el Sheikh, Hurghada, Marsa Alam, and other Red Sea resort areas are completely isolated from things going on in the big cities. Life here is centered around diving, snorkeling, desert trips, and other holiday activities. It is safe to venture out of your hotel and into the town centers using precautions you would use in any holiday destination. Your holiday representative will give you all the local details about health & safety, taxis and transportation, and excursions. Cairo and Luxor are no less safe than any other big city in the world. It’s always smart to avoid large gatherings of people, dark alleys, and stray dogs wherever you are. 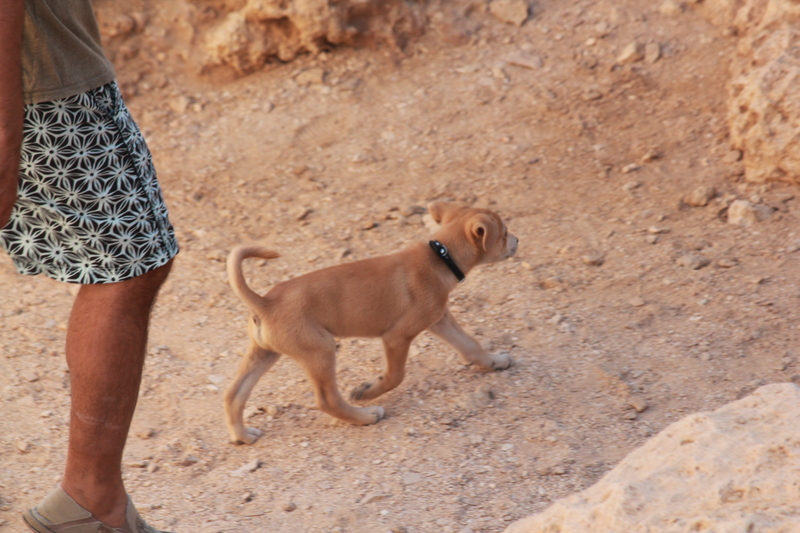 I once ran into a stray pack of dogs in Thailand by convincing my traveling companion to follow me taking a self-advised “shortcut”. 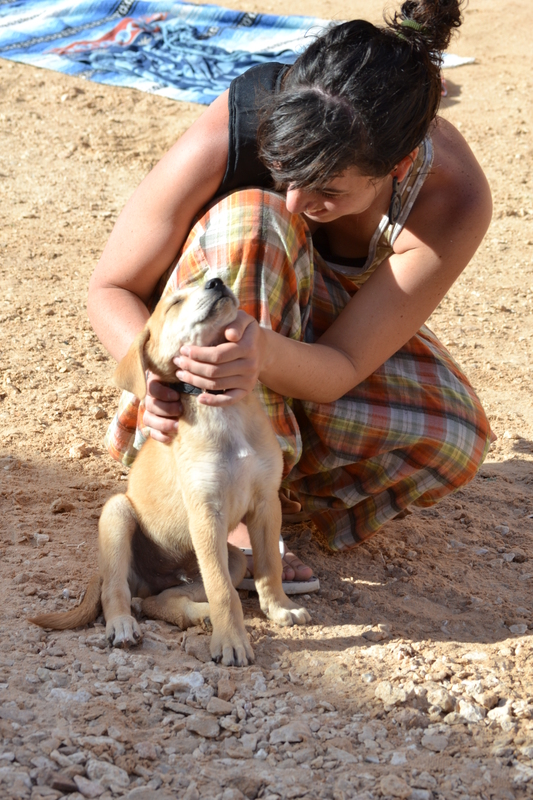 She didn’t want to, and actually rescued me from the very angry dogs that bounded out of everywhere on my approach. Practice common sense and good judgement. The best way to see the major sites like the Pyramids, CairoMuseum, Luxor & the Valley of the Kings is by guided tour. 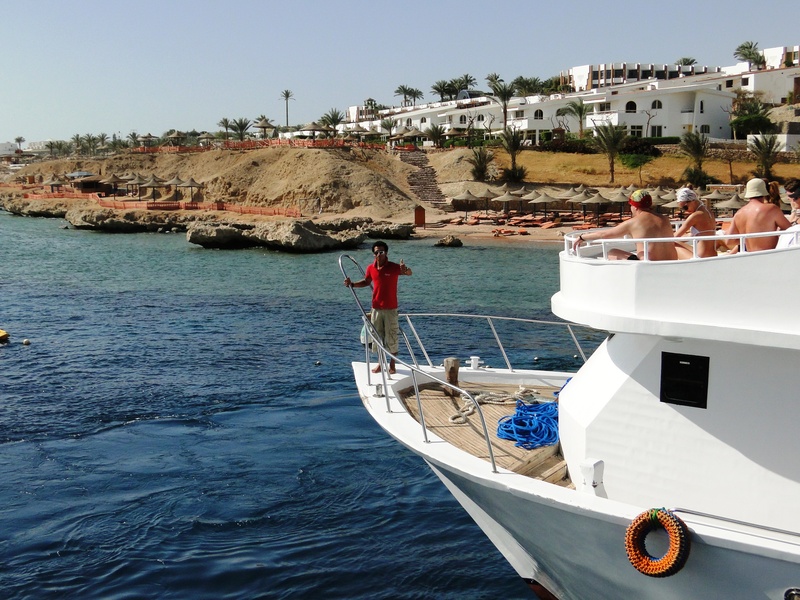 Your tour representative at your base in Sharm or other resort area is your best bet for excursions. Tours are well organized, insured, and offer you recourse if issues should arise. These are typically one or two day guided tours including at least one meal and several stops at points of interest, including shopping. You will also get a tour leader who will accompany you throughout the entire excursion. The sites of interest in Cairo are spread out over a large area so a well-organized tour is vitally important so you are not sitting in traffic for hours on end. Be wary of tours offered by people on the street or by the pool or on the beach. These are not your official tour representatives and many are not licensed and don’t carry insurance. The quality of tour could also be compromised, and as mentioned on the US & UK embassy websites: not everything that is cheap is good. Most incidents are not malicious but a result of unprofessional behavior and unorganized management which can lead to things like getting picked up late, forgotten in the desert, and sometimes even serious injury resulting from say, a crash when not wearing a helmet on a quad bike. Official tour groups expect a high level of service from the excursion providers and hold them to strict standards. Stick with your official rep! So, is it safe to travel to Egypt? My answer is yes! 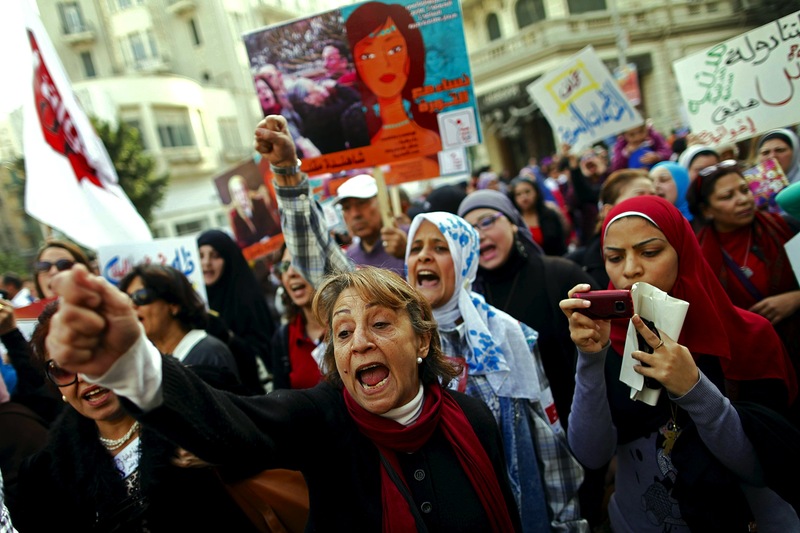 As an American woman living and working in Sharm el Sheikh I have never experienced a situation that made me feel concerned for my personal safety. 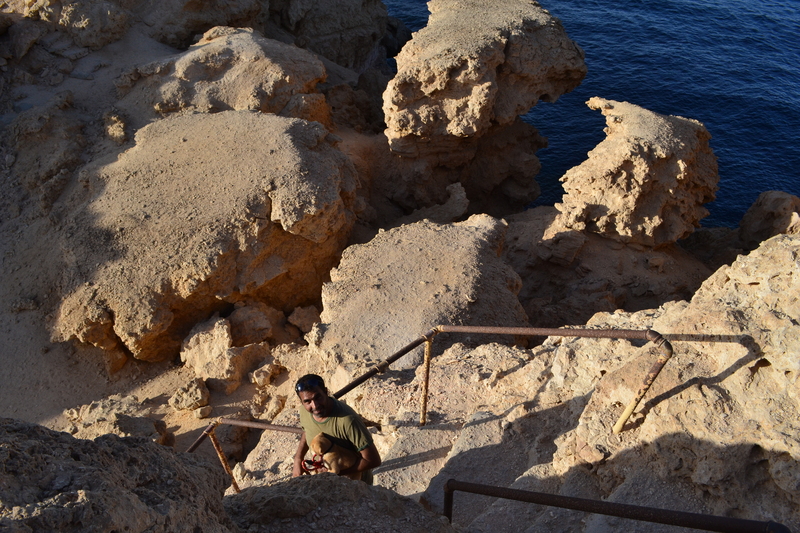 Here in Sharm, there are a lot of safety measures in place but it’s done in a way that is not invasive. There are speed humps throughout town centers to control traffic speed and promote pedestrian traffic and there are security checkpoints at the town borders and at all the roads that lead into and out of Sharm. You cannot enter a hotel or resort without intense scrutiny from the security gate and private cars are not allowed in at all. There is easy, inexpensive public transportation available everywhere, 24 hours a day that I’ve used extensively. Oh, and for that sleep well at night feeling, the UN multinational security forces (MFO) are stationed right outside of Sharm in the event of an emergency. So, if you’re concerned about travelling to Egypt, relax! Once you are here, you will realize that you’ve landed in one of the most amazing places in the world to go diving with stunning natural beauty above and below the water. You’ll seriously wonder what all the hype on CNN was about. The other side of Petra, Jordan. I think there is no need to describe what Petra is, where it is, why it is special, etc. It’s one of the top tourist destinations, and I think I’ve never met a person who doesn’t know about it. Nonetheless, that doesn’t make it less impressive. When I was there, I was pretty much silent all day long. It was like the words were unworthy, unnecessary. I already mentioned in one post how I often associate music with places/buildings. For Petra I couldn’t get Cortez the killer out of my head. 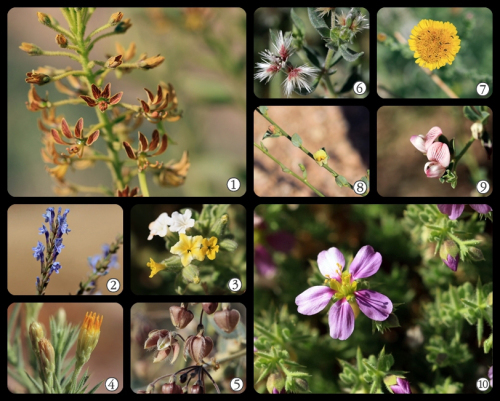 The Sinai desert is alive with flowers and plants! The Pyramids of Giza are incredible. We’ve started tours to Cairo from Sharm about 4 weeks ago and people are thrilled to be able to go back again. Guided tours are the best way to see Cairo so relax and book your trip! 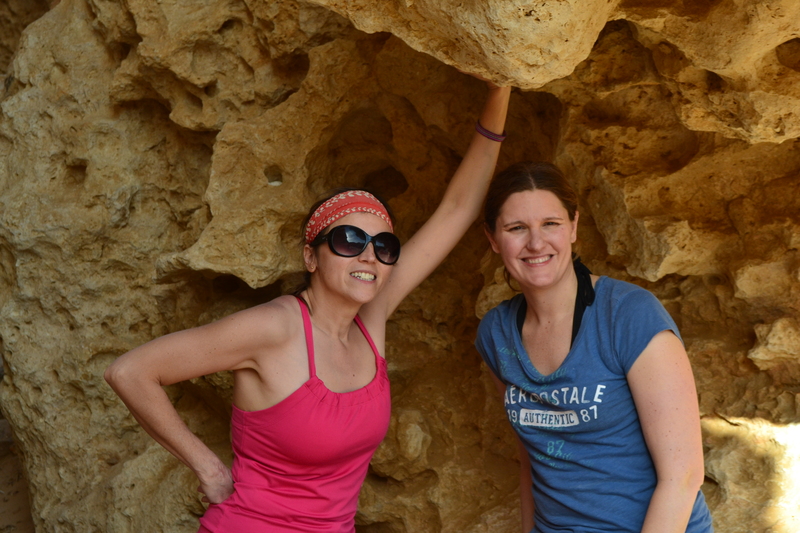 Adventures Abound in Egypt….and not just underwater! Egypt is known for its Red Sea beaches, awesome Alexandrian seaside for long nightly promenades and most importantly, the Pyramids. We are not exactly known for a land of modern adventures, but this is quickly changing. The young people of Egypt are hip, modern and fit (well, at least most of them) and they are demanding a change in the usual vacation time traditions. The idea of sitting by the beach and reading a novel seems too mundane for those who seek the thrill of excitement. That is why sports tourism is growing. 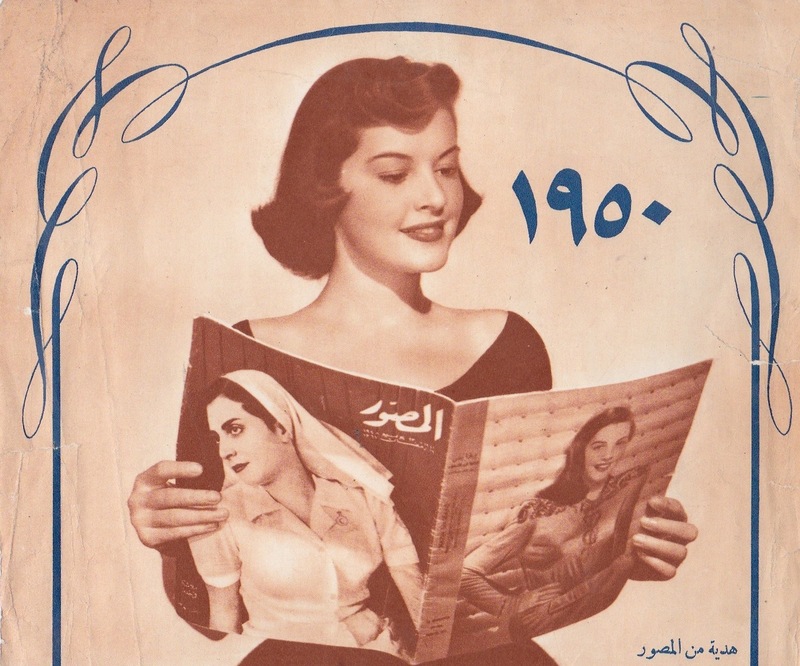 Take a quick historical photo journey through Egypt from 1800 to present day. Visitors are not allowed to photograph inside the tombs. Photo courtesy of Luxor Ministry of Tourism. The tomb of Merenpetah (1212-1202) is considered one of the most well preserved and colorful. Visitors are not allowed to photograph inside the tombs. Photo courtesy of Luxor Ministry of Tourism. Click to join me on Scuba Earth!